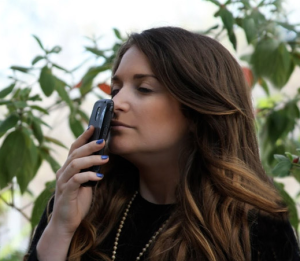 Google have just released their latest beta product named Nose. It is quite extraordinary because apparently they have figured out a way to get smells and scents to us over the internet through our PC’s and mobile devices like iPad and iPhone. The idea is that we can search for smells and not just content. And in the future we will be able to attach a smell to an image or a story. Think smell of buns and cakes in The Mad Hatter, or the acrid smell of cordite on a battlefield, the Somme in WWI. Can you imagine in the near future being able to smell a freshly cut lawn; roses in Summer or pine trees in the Spring? To smell the salt of the roaring ocean off the West coast of Ireland, or the damp jungle scent along the Amazon river? This is a wonderful leap forward in technology but I am still unclear about how they will do this. Do these smells come out of a USB port or do we have to buy some gadget from them that transfers the smells, or download them from the Apple Store? So far they are not saying, and I don’t mind if I have to buy a gizmo if I can smell so many beautiful things in our world. I hope they don’t plan to sell the smells, but knowing them they will. I mean Chanel No. 5 is not going to let their perfume go for free. I am quoting from an article on the Web which you can see here. And the original article from Google is here. Not so far away there will be a new technology called Mental and you just ask in your mind for what you want and it will appear on a huge screen wherever you are. And of course you will be able to smell the images that you see. Not a screen on a wall, but a screen that pops up in front of you, and you adjust its size with your fingers. Isn’t it a wonderful world we live in?